Is close to becoming reality. Researchers at IBM have revealed they are working on technology which will lead to consumers being shown tailor made adverts that reflect their personal interests. Digital advertising screens are already appearing in train stations, on bus stops and on the sides of buildings, but currently they only show generic adverts for a handful of products. Adidas today launched a new kind of in-store window shopping experience with a big giant screen that allows you order clothing and other products. Here is how they describe it in their press release. The new storefront window is a fully functioning virtual store with life-size products. The intuitive interface of the touch-screen window lets shoppers explore, play and drag life-size products they are interested in directly into their smartphone for easy and convenient purchase from adidas NEO online. By visiting a simple URL via their smartphone and typing in a one-time PIN, the shopper’s mobile becomes interlinked in real time with a shopping bag on the window, showing a live view of its contents. Any product dropped into the window’s shopping bag instantly appears on the mobile. The shopper can edit product details, save products for immediate or later purchase and share with friends through social media or email. 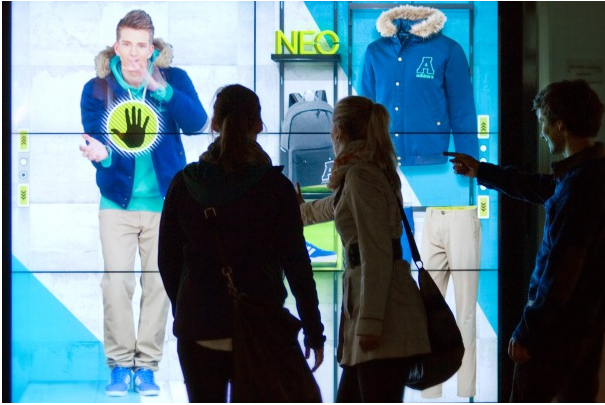 Shoppers can also play with a life-size digital model showcasing NEO’s fashion range in a fun and engaging way. By touching hotspots on the window the shopper can make the mannequin show product details, interact with the product and make playful actions and movements. The technology being used has been created by Oblong. They were founded in 2006 with the goal of creating the next generation of computing interfaces. Their Chief Scientist, John Underkoffler, designed the computer interfaces in the film Minority Report. Oblong‘s technology platform brings data sets, workspaces, and communications channels to life across multiple screens. It allows interaction from any number or type of input devices simultaneously, including touch screens, phones, and tablets. And it frees the user from sitting in one place, tied to one device. The three most important trends in the technology world today are cheaper pixels, evolving device form factors, and increasing amounts of accessible data. Oblong provides a new generation of computing tools — a new technology platform — built around these three trends. Previous postNot Enough Resources? – Find Some!